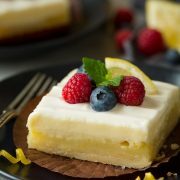 The best Lemon Bar recipe! 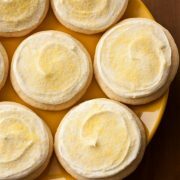 These are brimming with bright fresh lemon flavor, they’re deliciously sweet, and lusciously creamy and this buttery shortbread base is the perfect compliment to the lemon custard topping. You’ll love these! 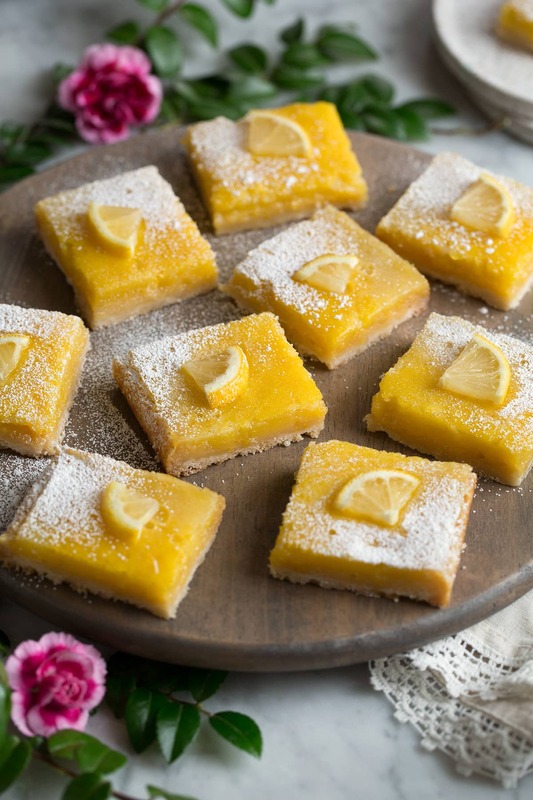 These lemon bars are deliciously tart with just the right amount of sweet to compliment the sour. 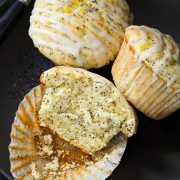 Their bold, fresh lemon flavor is paired with a more mellow hint of orange to tone things down without distracting from the star of the show. 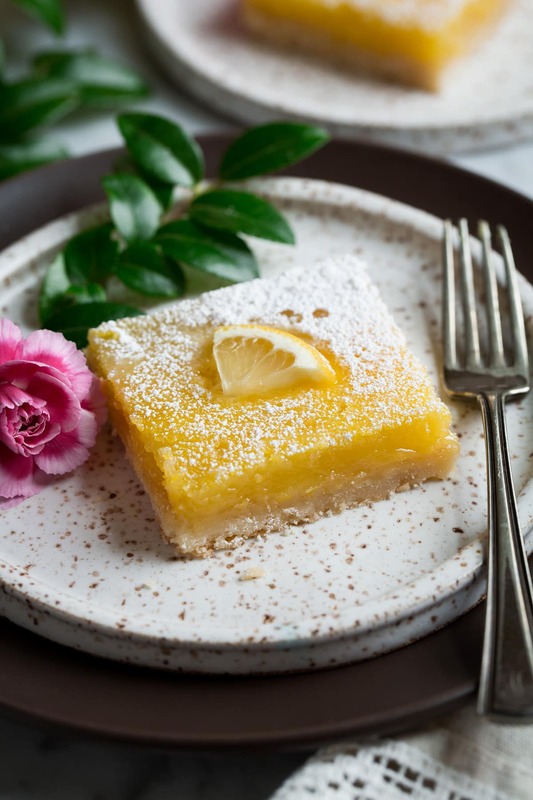 Both whole eggs and egg yolks are added to not only give structure but to offer a creamy and smooth texture to the lemon bars and a hint of cream is added for a nice balance. 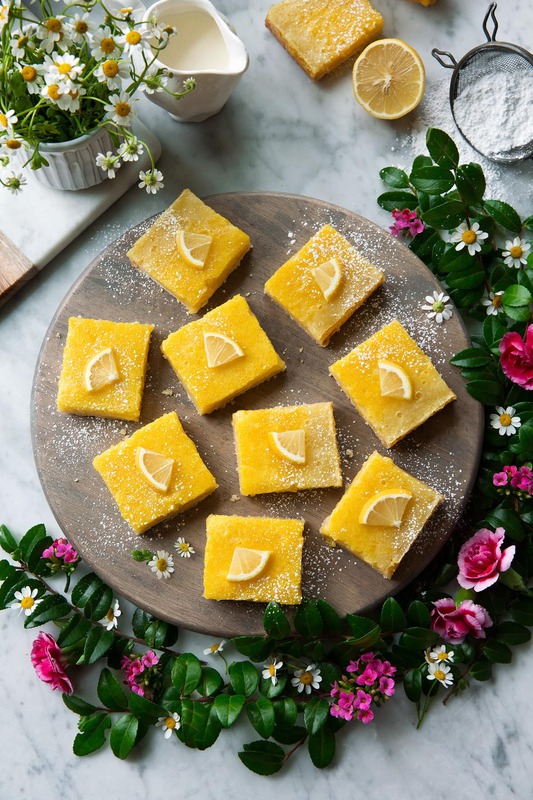 These lemon bars are anything but bland, so if you are looking for a fresh, exciting dessert recipe, don’t pass these by. 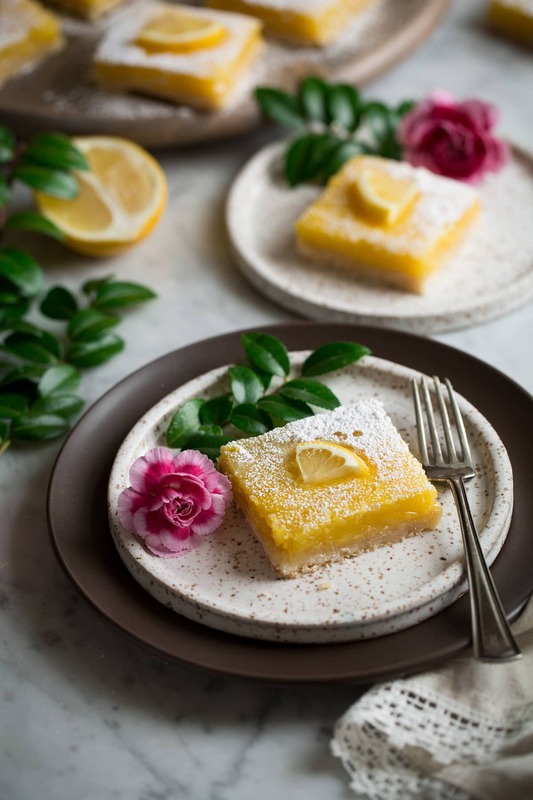 Give yourself a hint of summer to brighten these cloudy winter days by making some of these refreshing and decadent lemon bars! You’ll be glad you did once they are melting away in your mouth. Bite..after bite…after bite. 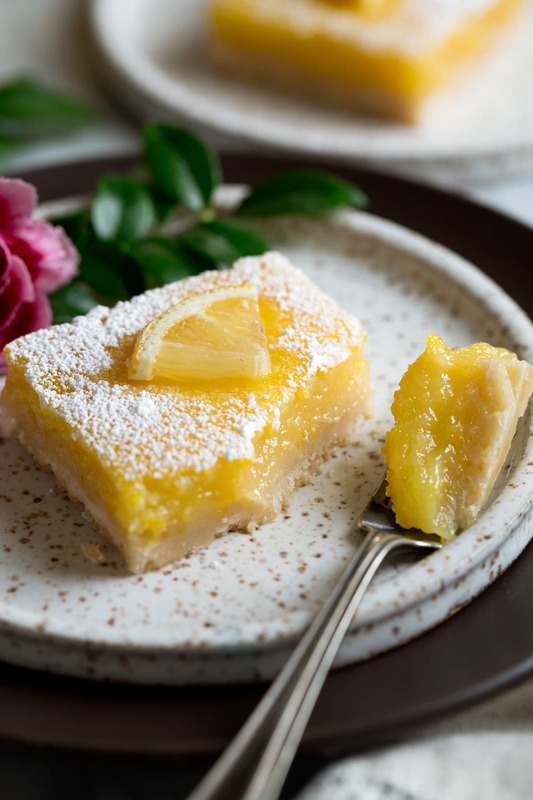 What Ingredients do You Need for Homemade Lemon Bars? In a food processor make the crust mixture. Spread mixture into baking dish. Bake 350 for 20 minutes. While crust bakes prep filling. Pour filling over hot crust and bake 325 until just set, about 20 minutes. Cool at room temp 1 hour then chill 2 hours. One key to perfect lemon bars is a crisp, buttery shortbread base. This version has the perfect ratio to butter and flour. And you’ll want to be sure to bake it long enough, it should start to appear lightly golden brown on top. Otherwise it may not be crisp leaving the perfect contrast to the creamy custard filling. 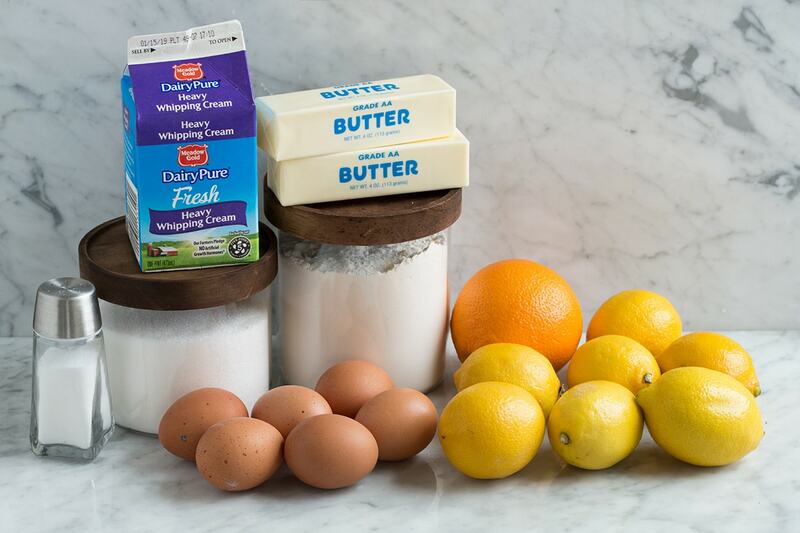 Can I Use Meyer Lemons? Meyer lemons will work in this recipe too, just keep in mind they’re a bit sweeter so I might suggest reducing the sugar by 1/4 cup. You can even replace the orange juice with more meyer lemon since it’s somewhat of a cross between a lemon and mandarin orange. Since they have a custard type topping they should be kept in the refrigerator. They keep well for 4 days refrigerated. 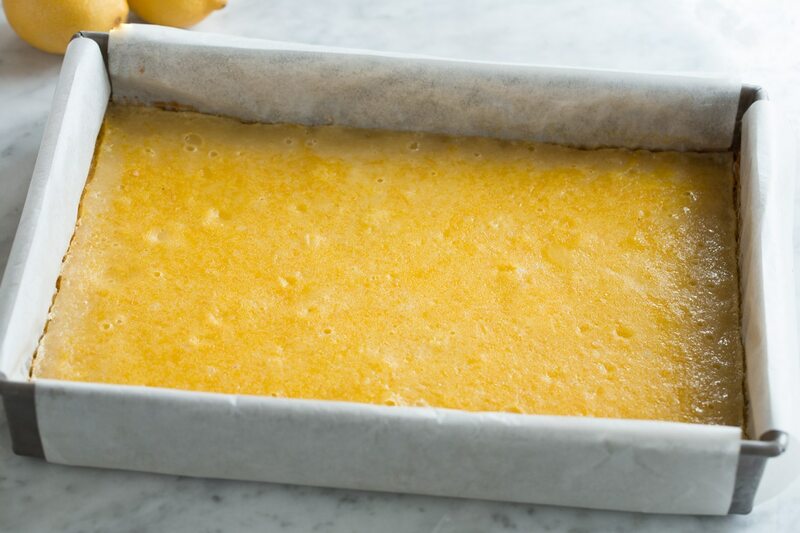 Yes lemon bars can be frozen up to one month. Use a zester not a grater for the lemon zest. I’ve seen several people do this and it just doesn’t work out well. You can find a good quality one for about $10. Be careful not to get any of the pith (white portion of the lemon peel) in the zest. Zest the lemon with gentle pressure. The white pith adds bitterness. Add the lemon custard mixture to a hot crust. This way it will start to cook right away and not sit and soak into the crust making it soggy. Don’t use old squishy lemons. Pretty obvious but the fresher are best. Use a combo of lemon and orange juice for a nice blend. That way they don’t end up overbearingly lemony. Use a bit of cream for a nice balance to the tang. More Lemon Recipes You’ll Love! Preheat oven to 350 degrees. Butter a 13 by 9-inch baking dish*, set aside. For the crust: In the bowl of an electric stand mixer cream together butter and sugar and salt until well combined. Add flour and mix until combined (it will seem dry and crumbly but keep mixing and it will come together). Press mixture into an even layer on bottom of prepared baking dish. Bake in preheated oven until lightly golden, about 20 - 25 minutes. For the filling: Meanwhile, in a mixing bowl, whisk together granulated sugar, flour and 1/8 tsp salt. Several minutes before crust is done baking, mix in lemon juice, orange juice and lemon zest, then add eggs, egg yolks and heavy cream and whisk vigorously to blend well. Pour mixture over hot crust, then reduce oven temperature to 325 and return to oven and bake until filling is set**, about 20 - 25 minutes. Allow to cool at room temperature 1 hour, then cover and chill in refrigerator 2 hours or overnight. Cut into squares and dust tops with powdered sugar if desired just before serving. Store in an airtight container in refrigerator up to 4 days. *If you'd like to be able to lift bars out to cut then line with parchment and butter parchment. **The lemon filling shouldn't wiggle when jiggled, it should be just set. Elaine: My favorite dessert is lemon pie! Amanda: Hi there! My boyfriend has been asking me to make lemon blueberry bars – this is by far the best lemon bar recipe I’ve seen! Do you think I could add blueberries to this recipe as-is, or would it need other adjustments?